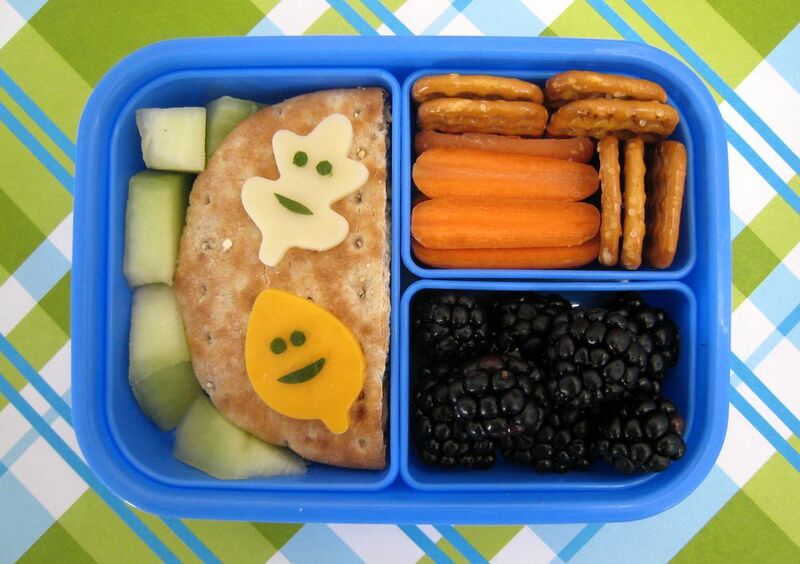 It's a lovely fall day in Dallas, so we're having some fall leaves in our bento to celebrate. And by lovely fall day, I mean it's 75 and sunny, I do love November in Dallas! I figure it's payback for the 100+ degree days in July. For lunch, Ben had a turkey sandwich with pesto cream cheese. I make my own pesto and then just use a dab of that in a dab of cream cheese to make a lovely sandwich spread. It's topped with a couple of happy fall leaves (their faces are made with bits of cucumber) on swiss and medium cheddar. To the left is some chunks of honeydew. To the right are some fresh blackberries, carrot sticks and a few pretzels. Of my 4 containers of blackberries, Ben has devoured 2.5 so far.